What inspired ‘The Beautiful Branch’? God is the source of my inspiration for writing The Beautiful Branch. I believe strongly that He is the One who through His Spirit sensitised my heart and placed the burden for seeing women live balanced lives in me. I get agitated when I see women who have issues with successfully joggling their responsibilities without any aspect lagging behind or who refuse to live to their full potentials just because they are females. I just know that it is very possible to be a woman that fears God and be one who lives purposefully in all aspects of her life. I decided to write this book to pass that message across. As a matter of fact, I had an idea of what I wanted to write about and the book title seven years before I began writing it. Tell us a little about the book. The Beautiful Branch addresses practically all facets of the life of a female and does this with helpful practical examples. Spiced with numerous relevant and impactful scriptures, it is a timely wakeup call and an eye opener needed to reposition a woman to her rightful position. The book expresses the need for self-realisation, dedication and actualisation. In this book, you will learn the secret to fulfilling God’s utmost purpose for your life. God wants you to be a total package of beauty and this book will show you how you can achieve that desire of God for you. The Beautiful Branch is laden with profound and practical teachings. On its pages you will discover how to become the kind of woman that God wants you to be. This book is filled with wise, practical, well-illustrated, simple and proven principles that make the reader to ask. . . How can I be beautiful in God's way? And you wouldn't have to look faraway for the answers because they are right on the pages of this book. This book will inspire you to fulfil your role as a woman at every phase of life. If you desire to be beautiful in every aspect of your life you need to read, study and meditate upon the awesome revelations in this book; open your heart to receive the truths therein and see your life revolutionise. If you desire to be a balanced woman, this book is for you. It is a must read for every woman. I have been writing since I was about eight years old; that’s well over two decades. I loved writing poems and stories for fun. When I was about fourteen, I began writing tracts for my church to print for evangelism outreaches. All the while I loved journaling and always embraced opportunities to submit articles for publication in magazines and newsletters. Writing for me has always been more like a reflex even though I did not seem to take my passion for writing seriously. 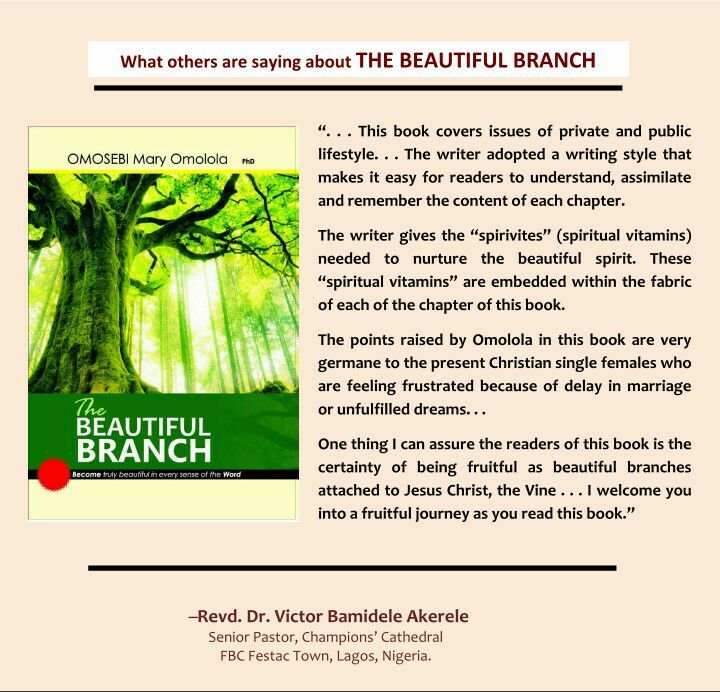 The Beautiful Branch is my first published book and I have published six other books after it. What has the reception of your works been like? I would say that my works have been well received by people. I constantly get feedbacks from people who read my writings. They call or write to tell me about how my book has inspired them. These feedbacks propel me to make sure that this book reaches out to more people and encourages me to write more. 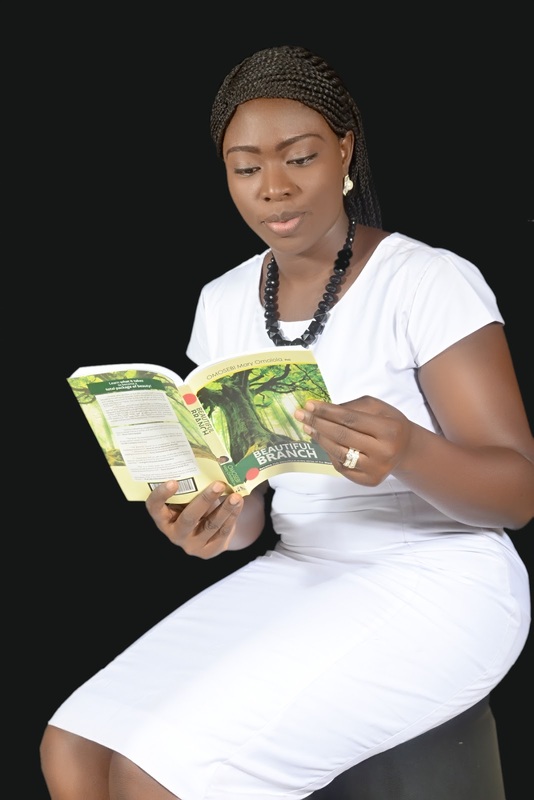 My Books are published by my publishing firm - Hill City Publishers, a recently registered publishing company in Nigeria with the aim of publishing inspiring books. 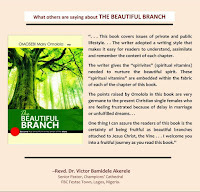 At the moment, The Beautiful Branch is basically being marketed via word of mouth. The book is also being publicised online via social media and email marketing. The book is also being sold through marketing agents in some states within Nigeria (more marketing agents are still being sought for). I am currently working on getting the book on the shelves of some leading bookstores in Nigeria. What are the other things you do other than writing? When I am not writing a book or blogging, I am most likely speaking to inspire people. I am a teacher of God’s Words and public speaker. I counsel people on matters relating to purpose fulfilment, marriage and relationships generally. I am pursuing a lecturing career in Food Science and Technology. I run an event planning and cake making business. I am also the founder of The Beautiful Branch Initiative that is involved in mentoring and grooming godly women, community development and charity work. I am also the head coach for The Beautiful Branch discipleship Course which is a program specially designed for women who want to have wholesome lives. I love reading and buying books. And yes, I love spending quality time with my family, cooking, travelling to see exciting places of the world and watching movies. Where can readers find your book or contact you? The Beautiful Branch and my other books can be purchased from my website.